I was first introduced to the music of Kate and Kacey Coppola when I saw the video for "That Kinda Beautiful" on CMT show "Music Row". Having never heard their music I was intrigued and proceded to delve further into their history. Their big break came when Kate and Kacey took fourth place in the CMT series "Can You Duet" which led to them receiving a recording contract in August 2008. 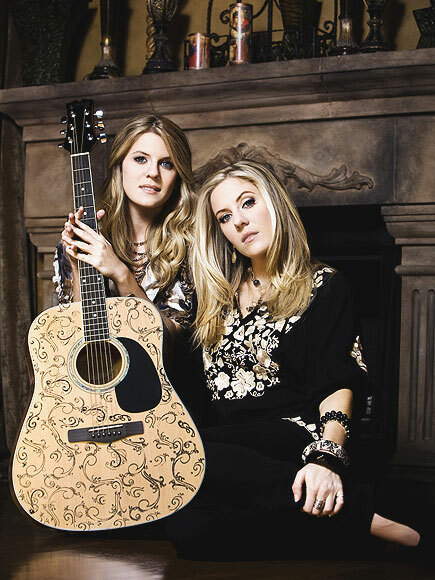 In the past they have opened for both Little Big Town and Kenny Chesney and they made their Grand Ole Opry debut on May 8th 2009. Their debut single, "Dreaming Love" peaked at #51 after ten weeks in the charts in 2009 however in early 2010 Kate and Kacey parted ways with their record company. Since then they have worked on, and released, their sophomore album entitled "Crossroad" on December 14th 2010 under a new record label. I was surprised to learn that the lead single from the album "Gypsy Soul" had failed to chart when it was released in early 2010. The song starts with a guitar riff reminisent of Bryan Adams and then it is only when the drum starts and the banjo comes in that you can tell it is a country song, and a very catchy one at that. Kate and Kacey could quite easily, and should easily, be linked to groups such as Lady Antebellum and Sugarland. They are just as easy to listen to and it's obvious that they have a lot of energy in their songs and performances. Perhaps my favourite song from from the album is entitled "Whole Lotta Gone". It starts simply with a solo of "Feel like a jukebox playin' a country song, about getting done and wrong, but you're the one that turned it one". All the while through that, and for a while longer it is simply one voice and a guitar until both the girls launch in with "I'm tired of taking it from you" and then "I feel a little used". It is truely a perfect song to direct at an ex or in truth to simply anyone who annoys you. "Crossroad" as an album is very diverse as well. Most of the songs are gutsy and catchy but then the last two songs on the album "Crossroad" and "That Kinda Beautiful" are songs that truely make you appreciate quite how good Kate and Kacey truely are and how much we are missing on shows like The X Factor. Both of them are amazing singer song-writers and musicians and I hope they get across to England very soon! A definite five stars from me!